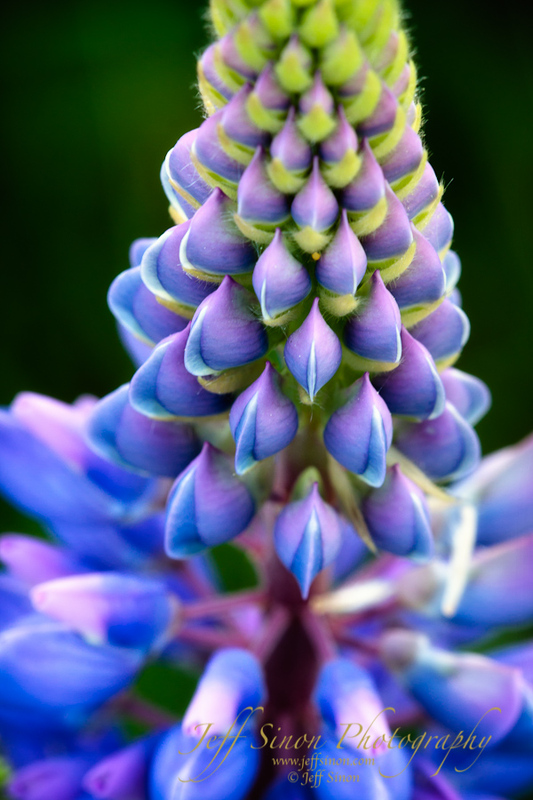 Fighting off the ticks while testing out my new Sigma 150mm Macro lens I was able to capture this vibrant close up of a lupine flower in the fields of Sugar Hill, NH during the Fields OF Lupine Festival. Last Saturday was a pretty full day for me photographically speaking. I, along with my buddy Joe Viger, had a little photo expedition in the works for a few weeks, but as usual for us the plan was to “wing it.” That is my kind of photo trip. With the loosest of itineraries we would end up where we ended up, and shoot what we shoot. We had decided on a late morning meet time since drive time from my place to his, and then his place to points unknown would have required an overnight stay on my part, and or an insanely early wake up time to catch sunrise. Boy do I wish sunrise came later in the summer time. As we talked, Sugar Hill, NH, and their yearly Fields Of Lupine festival kept popping up. 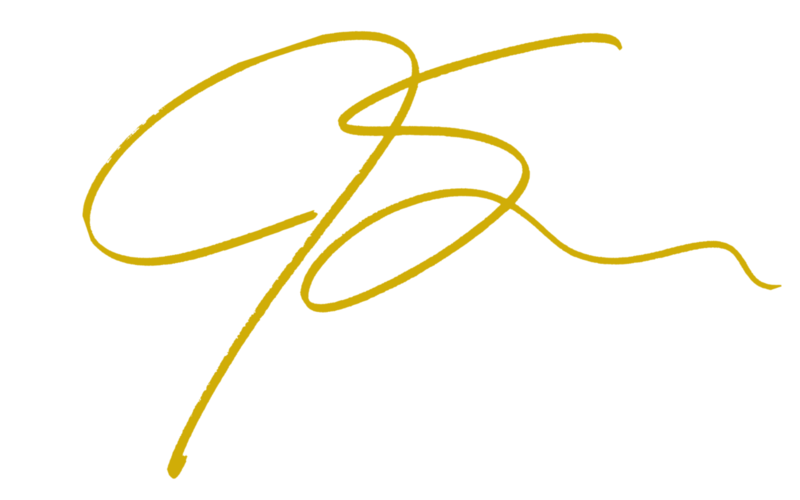 Joe had never been, and I had only been once two years ago. Our plans, such as they were, involved puttering our way to Sugar Hill for some late afternoon light and maybe a sunset to cap off the day. The trip took us over Sandwich Notch Rd. Sandwich Notch Rd is a seasonal road running through the White Mountain National Forest from Center Sandwich to Campton. Calling it a road might be a little generous, and while it is easily drivable in pretty much any car, oncoming traffic can be a real treat with what shoulder there is being a mixture of drop-offs, ditches and mud. If you are looking for a high-speed scenic cruise through the forest look elsewhere. Along the way, we stopped at Beede Falls. The light was terrible, so the camera stayed in the bag, but since these falls are on my list to shoot, and now I know exactly where they are, I’ll be back another time in better light. While riding shotgun along the remote and seasonal Sandwich Notch Rd, I spotted many lady's slippers along the roadside. 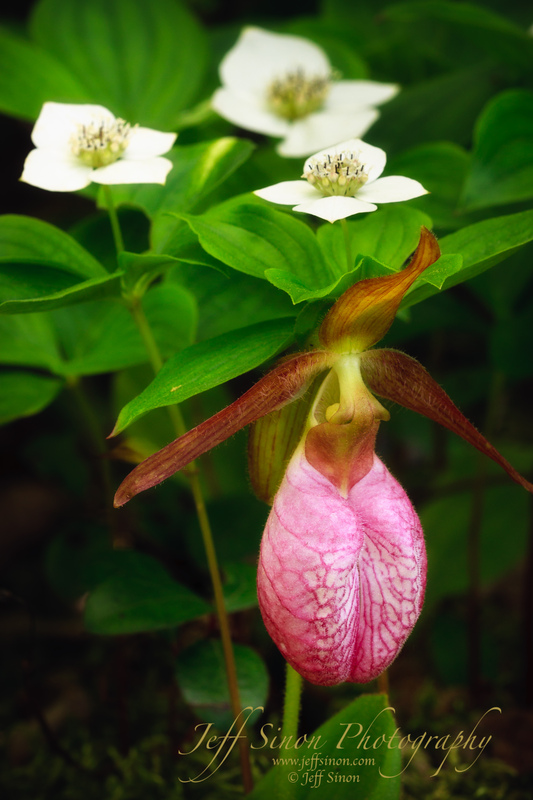 The bunchberry and lady's slipper together made for a nice photogenic pairing. Found along the Sandwich Notch Rd, this dragonfly patiently waits while I frame this image. Not long after the road turned to dirt, I saw pink. “Lady’s slippers, back up.” Joe couldn’t believe I saw them at the speed we were moving, and they were on his side of the car, but I have a built-in radar for my favorite wildflower. We pulled off the road and not only did we find plenty of lady’s slippers, but a large patch of bunchberry awaited us as we got out of the car. We spent twenty minutes or so doing the “wildflower crouch,” to get down nice and low and be one with the flowers. After our pit-stop, on we went. Being in the shotgun seat gave me the ability to scan the forest along the road for targets. I let out another “wait, back up, I thought I saw something,” and sure enough another wildflower to add the portfolio. 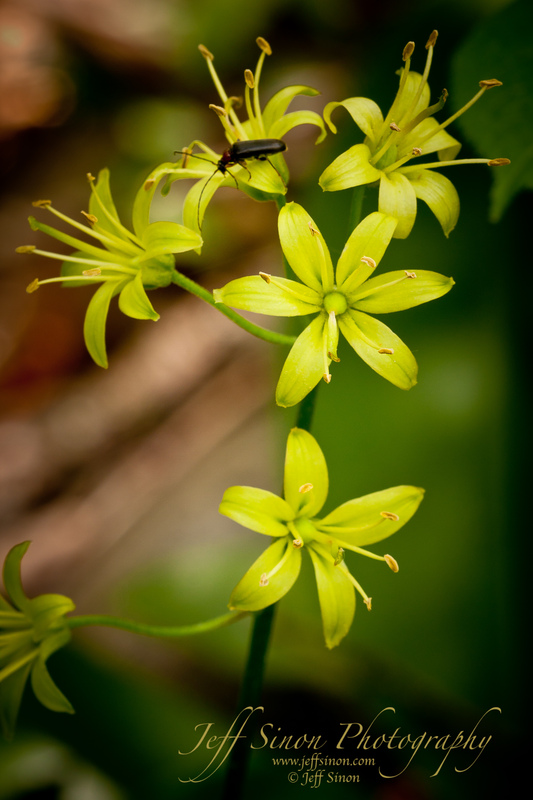 After breaking out the trusty Audubon Wildflower app on my iPhone, I discovered we had found some bluebead lilies. Where the blue comes from I don’t know, because as you can see, they are yellow. We found a lot of them and did our best, but the very slight breeze combined with the flowers long skinny stem, made getting sharp images a challenge. I did get lucky, and out of the corner of my eye, dragonfly! I’m always willing to point the camera at dragonflies, and this one stayed quite still as if wanting its portrait made. It was also another good test of my new Sigma 150mm Macro lens. I need all the practice I can get too. Getting the focus exactly where I wanted it was truly a test of my patience and willpower. Coming to the end of the road, it was time to head north to Sugar Hill and the purple, pink, and white lupine. I had been hearing reports that it was a good year, and was not disappointed by the numbers of flowers in the fields. Based on the direction of the light, one thought immediately came to me, most of the best fields received their best light during sunrise, and would be in shadow for our afternoon shooting. It took me a while to get my groove on, but once I did I think I came away with several very nice images and a realization about my photographic style. But I’m going to save that for another time. Let me just say I wandered around aimlessly for a bit until the “Eureka!” moment struck. After traveling to several different spots in Sugar Hill looking for the perfect view we ended up in the field behind St Matthews church. Personally, I think this is the nicest field of lupine in town, book-marked on one end by the church and the other by an old hay rake. Both making wonderful elements in a photograph. It was in this field that I made the two images that to me made the day worth it. It was here that I also realized that ticks love me. It seemed every time I looked down I had several crawling up my leg. But even after picking well over a dozen off of me while in the flowers, and several more on the drive home, I’ll be back. It will take more than a few ticks to scare me off. Whether down on my knees, or lying on my belly, next year I’ve got a date with the ticks in June in Sugar Hill’s Fields of Lupine. I’ll just go a little heavier on the DEET cologne for my next date. 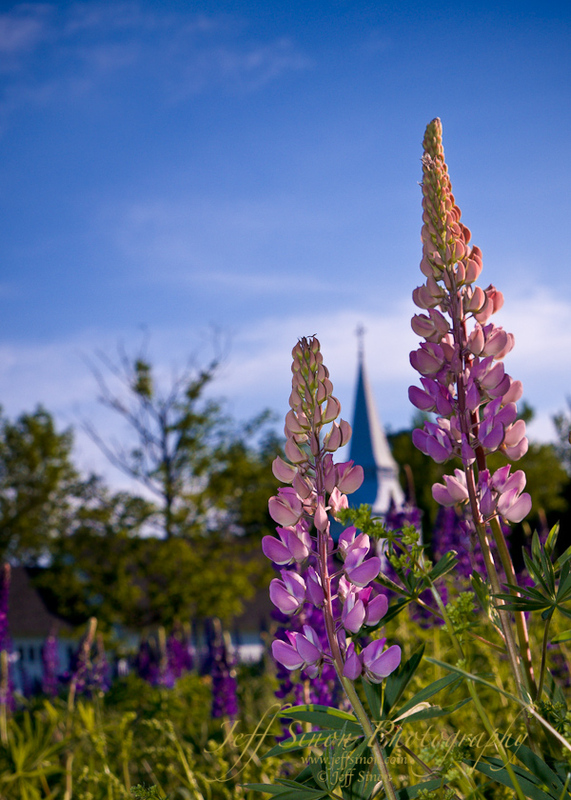 Most images from this popular field of lupine behind St Matthew's church in Sugar Hill, NH show a more typical view including a more complete view of the church. I chose to place most of the emphasis on the flowers, only including the steeple of the church to give a sense of place. Had a great time with the ticks. My next adventure it to hopefully get attacked by your attack grouse at Moose Mountain. the wildflower crouch! I know it well. Great series. ← Beauty’s Where You Find It.